Before there was bubble wrap to pop and satisfy our need for oddly satisfying tactile stress relief, there were pimples. Yes, popping a pimple may seem disgusting, but you know you love it when you pop one and the more pus that blows out the better. Well, when you run out of bubble wrap, pimples to pop, and videos of people popping their own on YouTube, now you can continue to relieve stress with this cool new Pop It Pal. 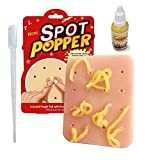 This fun yet quite nasty pimple popping toy simulates the act of popping huge pus-filled pimples. Below the surface of the silicone skin are 16 pores filled with fake pus that can be squeezed until realistically popped out. When you've satisfied your stress, just collect the pus, warm it in the microwave, and use the included filling tool to refill each pore. Once it cools down and hardens, feel free to continue popping those faux pimples again and again. Check out the video demonstration below to be extra horrified. Silicone skin with an all natural pus that simulates the popping of a huge pimple!